The Ansin Sports Complex in Miramar is a notorious fast track. This year the 2015 Louie Bing Classic will switch homes after a lifetime at Traz Powell due to stadium renovations. Throw in the top two programs in the state in Miami Northwestern and St. Thomas Aquinas along with schools like Hallandale, American, and Southridge and the competition is top notch. On the distance side Miami Sunset, Columbus, Coral Reef, STA the list goes on and on. Two dozen plus team will be in attendance this weekend at a meet that is guaranteed to set the standard of the track and field leaderboard on both the boys and girl's sides for the start of 2015. See how our virtual meet feature sees this one playing out! Note: This list is based on 2014 season bests and does not take into account transfers and incoming freshman. Could we see meet records go down? See the times to beat! The girls field is loaded in every event. 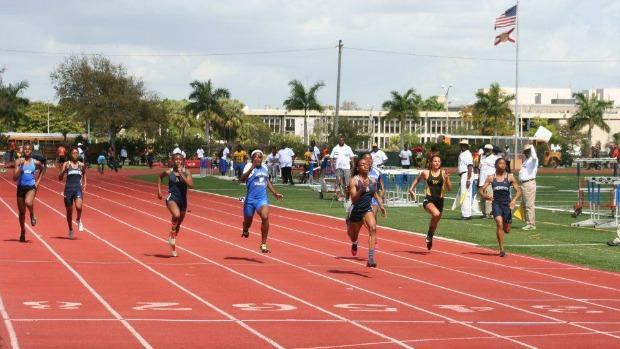 Krystal Sparling, Diamond Spaulding and Khalifa St. Fort give St. Thomas Aquinas the top trio of sprinters not just at this meet, but in the entire country. The Bulls have their own trio in Twanisha Terry, LaKayla Harris, and Alexis Harrell. Also in the mix is Symone Mason of Miami Southridge, and 2014 2A state champion in the 200 and 100m runner-up Alfreda Steele who is making the long trip form Pasco County. The top seven runners are all under 11.7 with Sparling's 11.34 the best in the field. Mason had an off day at the state meet in the quarter-mile last year finishing 10th in the prelims, but will have teammate Kayla Johnson in that race as well. Johnson and STA's Alon Lewis who was a part of the Raider's 4x400m relay team will duke it out in the two lap 800m run. Alexa Cruz is the reigning 4A state champion in the 3,200m and was fourth at 1,600m. She ran 10:43.79 last year at Texas Relays and should be the favorite at that distance but look for her to be pushed by Lauren Archer of Ransom Everglades in the 1,600m. Others to watch in the distance races include Archer's teammate Beatriz Ruan, Margaret Schloss of STA, Devin Molloy of Barron Collier and a trio of girls from Lourdes.